Four years after stepping in for a single performance of La traviata, the remarkable soprano returns to the Royal Opera House. I first came across Marina Rebeka when I attended a concert of Rossini's Petite messe solennelle in Rome under the baton of Antonio Pappano. I was completely smitten, both by her presence and the raw expression of her voice. Rebeka was born in Riga, Latvia — the same country that gave us the soprano Kristine Opolais and mezzo Elīna Garanča — and studied in her home city until continuing her training in Rome, Salzburg and Pesaro. Since then she has performed all over the world, appearing in a large variety of roles - out of which Violetta from Verdi's La traviata is a favourite. 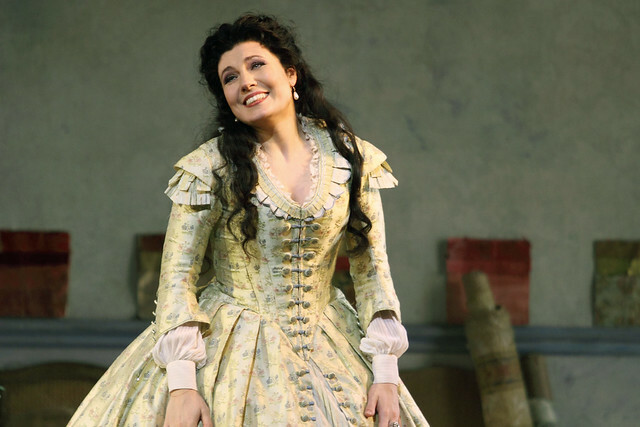 Rebeka made her debut at the ROH in July 2010 singing just one performance of La traviata, so we had to wait four years to hear and see her again as Violetta. She has recently sung the same role at the Metropolitan Opera where a reviewer said, ‘The famous lines, "Donna son io, signore, ed in mia casa (I am a lady, sir and this is my house)" were delivered with such firmness of sound and emphatic consonants that there was no questioning the verity of her statement.’ I can’t wait to hear her break our hearts. Sublime - best Violetta I have seen - what a wonderful performance tonight - totally agree with you ! She has such stage presence . Marina Rebeka was a fantastic Violetta last night. What a performance and such stage presence. This is the best Traviata we've seen! I am just home from La Traviata and was completely undone – in the best way – by the beauty and poignancy of Maria Rebeka's singing. Never heard such applause before. Superb: a privilege to be in the audience.